Pilloried worldwide for his failings off the course, the fallen 14-time major champion has been forced to eat humble pie both on and off the golf course for close to two years. Yet Clarke believes he knows a different Tiger - the kid beneath the scowl and the scandals. So why root for Tiger? Tiger Woods is happy he’s playing with Darren Clarke in Akron this week. Picture by Fran Caffrey www.golffile.ie“Because beneath it all, beneath all the stuff that’s happened, self-inflicted or otherwise, he is essentially a really good kid, a man, beneath everything.” world No 31 Clarke said of the world No 28. “You know, sometimes his media image has been portrayed in a very poor, poor way, some that again, from some of the stuff he’s been through. Woods was equally eloquent in his praise of Clarke’s tremendous major championship breakthrough - a victory he had lived vividly as he sent his Irish friend texts of encouragement throughout. 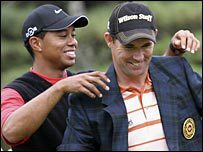 Woods added: “He’s always been a great friend to me, and we’ve been great friends for a long time going back to when we both worked with Butch a long time ago. “It was great to see Darren play well. He’s gone through a lot in his life, and to see him - I think he’s 42 now - win an Open Championship and the one that he covets the most, that’s very special to him, and the way he did it was very impressive. The pairing of Woods and Clarke will see the renewal of a rivalry that began at La Costa in 2000, when Clarke handed the American a 4 and 3 defeat in the final of the Accenture Match Play Championship. Darren Clarke is a happy man these days. Picture by Fran Caffrey www.golffile.ieThey’ve clashed many times since and while Woods has come out on top more times than Clarke cares to remember, he left the former world number one six shots in his wake here in 2003, when he captured the WGC-NEC Invitational title for his second World Golf Championship victory. The loss of his wife Heather to breast cancer in 2006 put the Ulsterman’s bid for major glory on hold for several years as he dedicated more time to his young sons. Clarke’s game deserted him for a while but having finally scaled the mountain top in Sandwich last month, he confessed that he has picked up the phone and given Woods some words of encouragement from time to time. Why? Out of friendship. He wants to see old Tiger again. “You’ve got Jack and Tiger and he was arguably the best player the world has ever seen,” Clarke said. “I’ve just won one major. He’s got buckets of them. It would be a little bit presumptuous of me to tell him what to do. “But in saying that, I’ve told him what I think about what he’s doing golf swing wise and stuff and sometimes he takes it in and sometimes he doesn’t take it in. Tiger Woods says he’s pain free after his 12 week break. Picture Fran Caffrey www.golffile.ieAll has changed in the world of Tiger Woods since he limped off the golf course after just nine holes of the Player Championship at Sawgrass 12 weeks ago. All and nothing. The former world No 1 has seen Rory McIlroy emerge as a rival to his throne with that eight-shot US Open victory, watched good pal Darren Clarke win the Open at the age of 42 and slipped to 28th in the world for his poorest ranking for 14 years.